Who else is happy to see the back of the snow? I know it’s not tropical weather but at least the mornings are now becoming lighter which is making my walk back from the gym better and I’m not trekking through snow! Even though I’m like a reptile that needs heat on me 24 hours a day I am determined to embrace spring clothing. I said in my last post it is all about layering and at the moment I am having a thing for jackets and blazers. I have my eye on the contrast leather and linen piece I featured before, if I’m still thinking about it in a weeks time it might be worth investing in, let me know your thoughts? Wearing jackets and blazers at this time of year you want to make the most of layering up on your thermals without looking like the Michelin man! It’s all about the secret thin layers that nobody sees. Secretly here I’ve added two tops under my long black rib top so I am able to wear the blazer on its own. For a while now I’ve been drawn towards more tailored pieces, including suits. I really admire women who can pull off a suit, whether it’s a simple black two-piece or the colourful power suits. 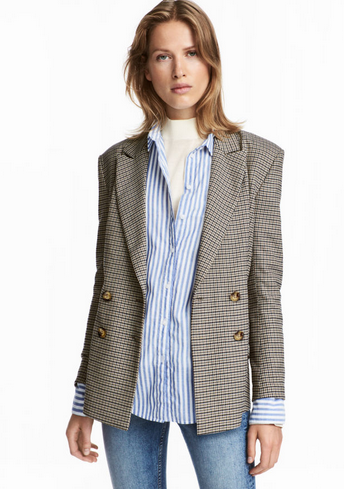 Feeling very inspired from the street style shots of fashion week, where you can see tones of checked tailoring I decided on purchasing this & Other Stories beautiful checked two-piece suit. This suit has a real masculine 80’s power suit vibe. Some other lovely check blazers. I just love anything oversized, especially blazers and when you are wearing a fitted top underneath its a really lovely contrast. If I can give you one piece of styling advice for right now it would be to size up when investing in blazers. This means you can wear them over your knits now in spring, but also look chic over t-shirts for the summer. As I’m quite feeling checks and that from watching the catwalks they are here for the following season, I’ve put some key pieces worth investing in now.